I spend a lot of time in my van, and I pass much of it by listening to my favorite Christian music artists. K-Love radio and Sirius XM’s “The Message” are the only stations that I tune into on the radio. When I’m in the mood to control the songs that I hear and create my own playlist, the 30GB hard drive integrated into the van’s entertainment system gives me the ability to listen to music for days without ever repeating a song. 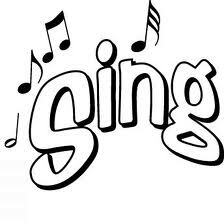 I belt out the words to song after song never tiring of what I’m hearing. I sing my heart out; don’t want to hold out on songs of praise and worship, you know? When the kids are riding around town with me, they don’t hold back on their self-imposed Idol judge roles. Shouts of, “Mom, you’re off key!’ and grumbles of “Oh, there she goes again!” are common. I just laugh and keep singing! Despite the constant mid-row heckling that I get from two of my very opinionated offspring, I sing out loud as often as the Spirit moves me to do so. I cannot be shamed into silence. Now, I could choose to heckle the kids in return as they are singing, but I’ll just let them be and join in on the moment! Today, I am thankful for being who God made me. While He’s still encouraging me, shaping me, teaching me, emptying me of myself, and filling me with more of Him, some aspects of who I am are exactly as He wants, and I do believe that He wants me to sing as if no one were listening. I praise You for making me comfortable enough to sing out loud songs of praise even when the kids are listening. Especially, when the kids are listening. I pray that the time that I spend with the kids is full of moments like the ones that we laugh about now. I pray that these experiences will become etched in their memories forever. I ask these things in Jesus’ name, Amen! I don’t have the patience to mix up a batch of homemade cookies, so I’m a huge fan of ready-to-bake cookie dough. During the holidays, I baked the usual variety for the kids to decorate: gingerbread and sugar cookies. Being in the midst of the magical season and wanting to do something different, I tried a new flavor: White Chocolate Macadamia Nut. They…were…heavenly! Just the right amount of white chocolate chips (I’m not a big fan of any kind of chocolate chips, so this was a bonus) and enough macadamia nuts to taste in every bite. So, as I was speeding through the grocery store a few days ago and picked up a package of dough, it didn’t occur to me to check out the brand label. Big mistake! I learned the hard way that not all refrigerated cookie dough is made of the same caliber. The moral of the story is that, sometimes, brands do matter. 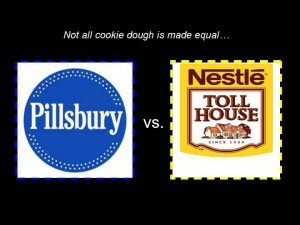 In this case, Pillsbury is the clear winner. Sorry, Nestle! Do brands usually matter to you? What are some exceptions to your personal rule?